The GSP was developed in Germany in the late 1800’s to be an all-purpose dog. It was the original intent of the breeders to develop a breed of dog with inbred instinct for multiple tasks, thus requiring little time to “force train”. The GSP was bred to point, retrieve, trail wounded game, hunt both large and small game, furred and feathered and to work in low or heavy cover as well as water. The dog was also intended to be a family companion good with both adults and children. To Celebrate and acknowledge the dedication, determination, training and outstanding dynamics of a dog, in a single year as exemplified by the title(s) and tests that it has accomplished. This would be done through different venues in all areas of performance and testing. To give credit and acknowledgement to other awards and titles in addition to what the AKC or our parent club currently recognizes. We are a AKC Club and GSP club of America organization. Not all GSPCO are members of the GSPCA. Members of the GSPCO often are members of other organizations and clubs that have, or do other tests or events that the dogs enjoy. This would help further prove and promote what the dogs are bred for, and what they enjoy. Also this is for those individuals that may never receive any recognition for the time and effort put into those events, venues and cross training. Current and future members may become more active by trying to get involved in the existing club activities or new events that they can participate in. Owner must be a member in good standing for one year, before submitting their dog for the award. If the dog is co-owned, the dog must permanently reside with the primary owner, who is a GSPCO member in good standing. Award starts on January 1st of each year and ends December 31st of each calendar year. The individual owner will track Testing and Titles, and proof of testing or title will be submitted at the time to a committee for selection, on or before December 31st. Phone entries will not be accepted. E-mail with scanned copies will be accepted. Recipient of the award will be announced at the January annual meeting. The dog that has the most titles or titled tests in the calendar year will be selected by the committee to receive the award. All titles and tests are of equal value when it comes to the award. Named winner will need to achieve additional new titles and awards the following year to be considered for the award again. Awards and Titles used originally to receive in the award cannot be counted in the total again. 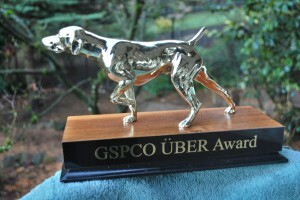 Dogs that DID NOT receive the award, can use their existing awards and titles, plus any additional ones the following year to submit to the committee. All the titles that a dog has achieved do not need to won in one year, but rather an accumulated list, provided that none of these awards had counted toward previously winning this award.